> OK George I bite - how does one detect the infamous cracked C pillars. We see them cracking on '89 through to '94 models. It's rare on later models. Perhaps Toyota have used a different grade steel on that panel. If you do find cracks there, then you may as well check the welds on the upper rear roof line. 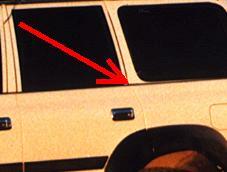 In fact, open the tailgate doors and check all around the rear body opening for cracks. Any cracks need to be seen to asap. They rust and just keep growing.